Why is Barclays exiting its Africa business? Firstly, he said it would create “a very simple, clear vision for Barclays” as a bank focused on its two core markets of the UK and US. Secondly, he explained that Barclays was “structurally challenged” as the majority owner of the African operation. It has all the downsides of owning 100 per cent of the business, but benefits from less than two-thirds of its profits. ……. The African operation produced an attractive 17 per cent return on equity last year in local currency, but this fell to 8.7 per cent at group level, below its 10 per cent target. In addition, the Wall Street Journal reports that the bank is selling its Asian wealth management fund in order to focus exclusively on the US and UK markets. Cutting the African division “was a very difficult decision,” Mr. Staley said. A U.K. tax on bank balance sheets and the regulatory costs that come with holding the unit outweighed the benefits of keeping it, he added. It is unclear when Barclays will start to sell out of the business. In short, this data point does not reveal any new information on the state of the African economies in which Barclays is a major player. Former Ugandan Prime Minister, Amama Mbabazi, is running for president. He hopes to challenge incumbent Gen. Yoweri Museveni in the ruling party’s primary ahead of elections next year. Museveni will win, but Mbabazi’s candidature is probably the most exciting thing that will happen in this well-choreographed electoral cycle. The police are already on his case. Peace and prehistory in Somaliland. You never hear much about Somaliland, the quasi-independent state to the north of the Republic of Somalia. This nice piece by Stanley Stewart documents what Somaliland has to offer as a travel destination. I am maxed out on summer readings, but FT just released their own wide-ranging list of summer books. The one must read I’ll put on my queue is To Explain the World (FT review), by Stephen Weinberg. The problem of urbanization without growth. The (developing) world is urbanizing fast, but will this trend result in an unambiguous improvement in human welfare? 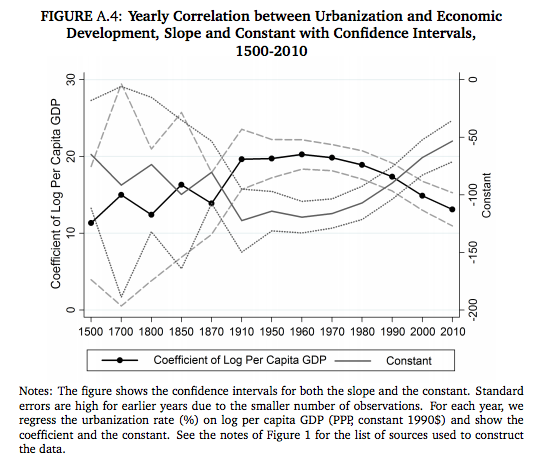 This post reminds us that throughout history urbanization has not always gone hand in hand with economic growth (See also here).